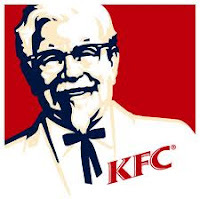 If you saw that I liked KFC on Facebook, I debated for over a week whether to like the page or not (I try to keep my brand fan pages I like to a minimum), but I was just too curious about the Colonel Sanders autobiography & recipe book that launched exclusively on Facebook . . . I just downloaded the entire book for free. The book is called "Colonel Harland Sanders: The Autobiography of the Original Celebrity Chef” and was written by the Colonel himself in 1966. The original manuscript was found recently by accident. The book is centered around the Colonel's passion for food, his work ethic, and his thoughts on the importance of home-style country cooking and includes 33 never-before-published recipes. I'll probably end up cooking something from the book before I actually read his story. The French Fried Parsnips and Cauliflower looks interesting, and the Upside Down Peach Cobbler sounds delicious. Maybe I'll make a Colonel Sanders dinner sometime soon.